Heute ist Sonntag, also Zeit für eine neue Tilda & Co. Challenge ! "Muttertag" mit der speziellen Option "Recycling". Meine Schwiegermutter ist ein stadtbekanntes Schleckermaul ;), deswegen bekommt sie eine Schachtel feinster schweizer Confiserie. Damit das Geschenk nicht ganz so farblos ist, habe ich eine aufgepeppte Verpackung aus Designpapier gebastelt. Die Recycling Option habe ich sogar auch noch geschafft, obwohl es gar nicht so aussieht. Aber die zwei rosa Herzen warne mal auf einer anderen Geschenksverpackung drauf und ich habe sie mir einfach herunter stibitzt. Die neue Tilda mit dem Liebesreis ist wieder so goldig, dass es einfach nur Spass macht sie anzuschaun. Das Colorieren ist auch ganz super gegangen. Ich freue mich schon darauf eure Muttertagswerke zu sehen. Danke dass ihr bei mir vorbeigeschaut habt und vielleicht einen Kommentar hinterlaßt! Vergeßt nicht nächste Woche wieder reinzuschauen, da ich dann meinen Magnolia blog candy veröffentliche um die 10 000 hits auf meinem blog zu feiern! Today's sunday, which means it's Tilda & Co. Challenge time again!! "Mothersday" with the special option "Recycling". Because my mother in law has a sweet tooth, I want to give her a chocolate box with excellent Swiss pralines. To pimp up this present, I did this embelished bag out of patterned paper. I did manage to fulfill the recycling option, although it doesn't look that way ;) I nicked the two pink hearts from another present wrapping some time ago. The sentiment is German and means "Thank you for always being there!" Isn't the new Tilda with love rice gourgeous? I had great fun colouring her! I can't wait to see your creations for this weeks challenge! Thank you so much for having a look and for leaving a comment. 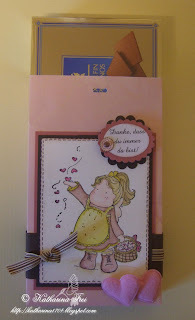 Don't forget to pop in next week, to check out the Magnolia blog candy I will give away to celebrate my 10 000 hits! hallo katharina... wie absolut suess!!!! die farben dein ausmalen... echt klasse geworden! Wunderwunderschön. Eine tolle Idee und die Umsetzung ist sooo süüß. I love your card ! so fresh and pretty! Really like the coloring too... ! Ach Katharina, das ist wieder zu herzig! That's a great little gift bag. The colours are so pretty and the stamp is fab! Wow, Wow.. this is Awesome!! really love the idea and soo useful to! 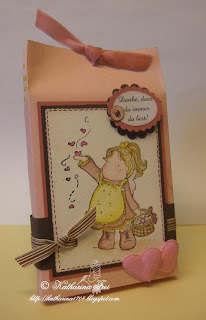 What a beautiful way to dress up a box, the bag is gorgeous and I love those hearts you kept, I keep everything, just in case! You have a beautiful creation, and I love your new pic. Eine tolle Idee und superklasse umgesetzt! tolle Idee, und klasse umgesetzt!! Tilda is so pretty and anything with chocolate is a winner!